A winter wonder to wow all the family! Put your pasta on to cook. Add the onion and sauté gently until softened then add the garlic. Fry for a minute. Pour in the stock . Add the spinach and cook for a minute, then add the crème fraîche and stir in. Season with black pepper. 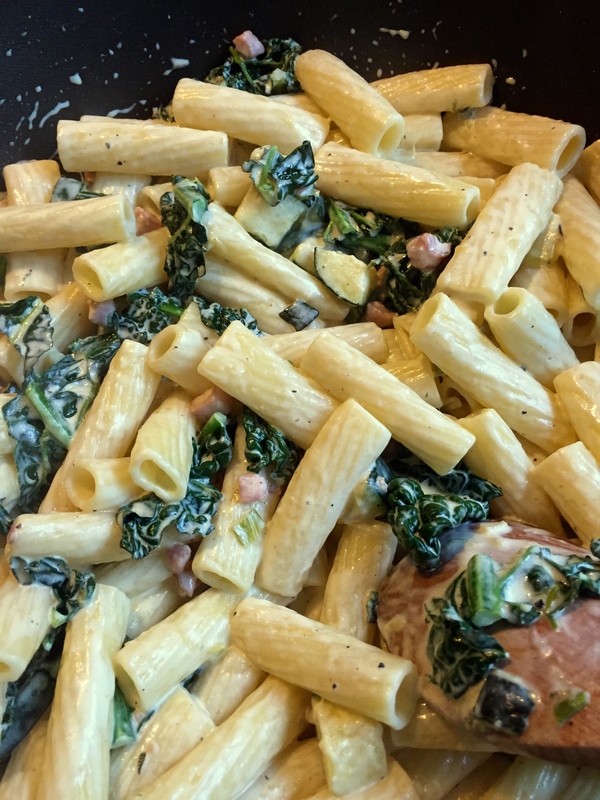 When the pasta is cooked, drain well and add to the creamy mixture. Crumble in the goats cheese. Add the chilli flakes and the torn basil leaves, then the walnuts. Stir gently. A fabulous dish for late autumn and you can play about with it as you wish. Use different greens – maybe rocket – maybe savoy cabbage finely shredded or even crumbled broccoli. You could use pine nuts too. Tis up to you! But you MUST try it! 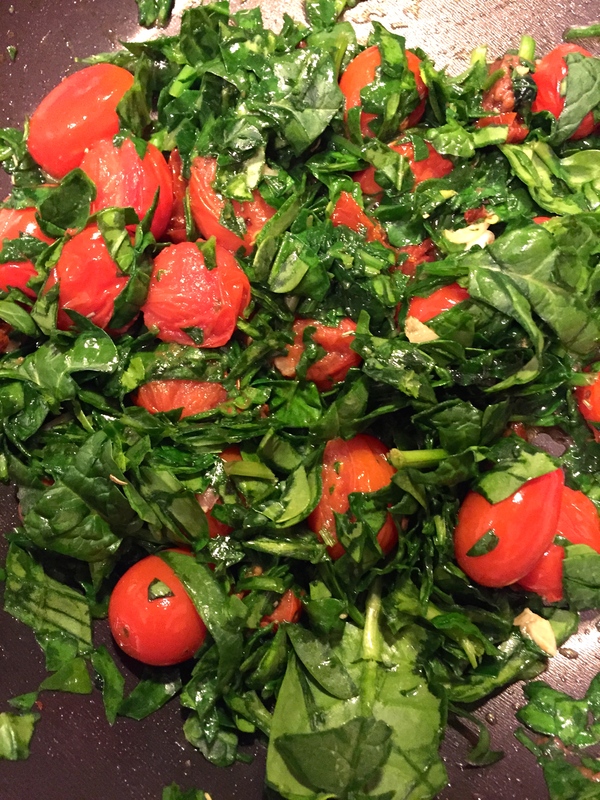 I love spinach and I love finding different ways to get it into my recipes. Here I have adapted one of my favourite easy suppers to accommodate the gorgeous green stuff. Add a good splash of olive oil to a large frying pan or preferably a deep pan such as a non stick wok. Pop in the garlic and warm the oil – add the tomatoes and bring the heat up until the tomatoes are starting to gently sizzle. Add the spinach and coriander and let them all wilt and flop together over a low to medium heat for about ten minutes whilst the pasta cooks. Add a splash of truffle oil, black pepper and a good grind of sea salt to the tomato mixture. Once the pasta is ready and drained, add the cream to the tomatoes and warm through, stirring all the while for about 2 to 3 minutes. Malloreddus con Ragu` di Selvaggina I had a fabulous bowl of this today at one of my favourite Italian restaurants, Pani’s, situated in Newcastle. The restaurant serves home made Sardinian food of the best quality you can imagine in the most atmospheric of restaurants. Wonderful people work there and make you feel like you are in deepest Italy. 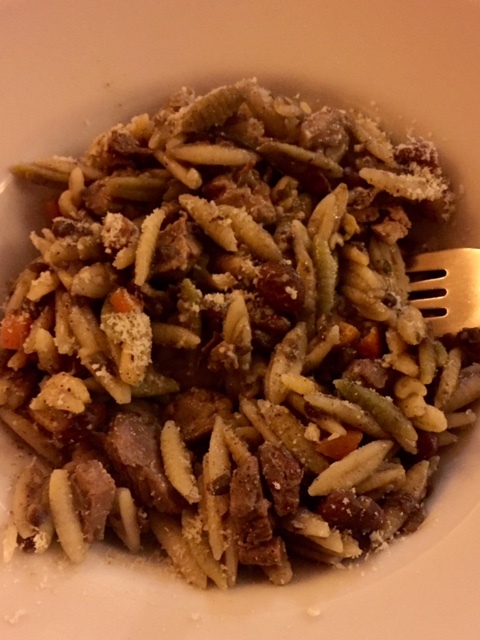 Malloredus is a typical italian pasta and it is served here with a game-ragu, made with lentils, borlotti beans, carrots, celery, onion, chilli, garlic & fresh herbs. 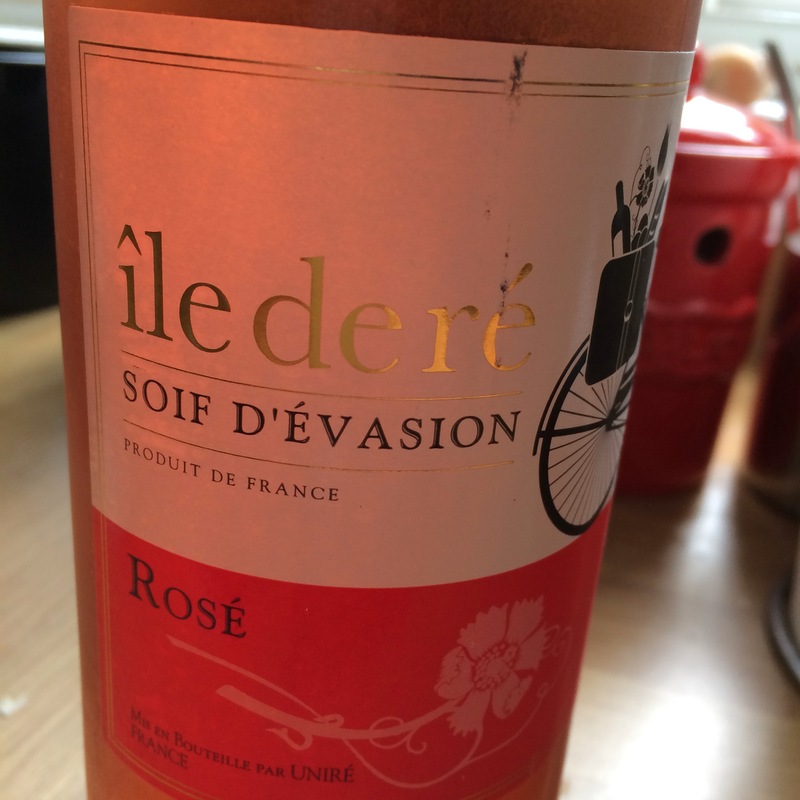 Stunning and very wintry – perfect for a day or two after Christmas when you are trying to move away from the over familiar flavours of turkey etc! This is a recipe I have found which comes close to the one i had. You can use whatever game you fancy or can get your hands on. One to experiment with and adjust to your tastes. It’s a marvellous dish. Oh….and if you are ever in Newcastle – eat in Panis ! Pour two or three good glugs of olive oil into a large casserole dish and heat gently. Add the pancetta, celery, onion, carrots, garlic, chilli, rosemary, thyme and bay leaves and cook gently for 10 minutes. Stir in the meats (and liver if using) and the flour. Stir and cook for 1-2 minutes. Pour in the wine, a generous pinch of salt and pepper and stir. Let cook for 5 minutes. Pour in the stock (there should be enough to just cover the meat). Bring to a gentle boil, cover with foil or a lid and cook for 1 ½ – 2 hours (check liquid level every ½ hour) or until the meat easily falls apart. Add the borlotti beans for the last half an hour. When finished cooking, remove the bay leaves from the sauce. Add butter, half the Pecorino, half the orange zest and stir well to combine. When ready to serve, pour ragu over pasta and sprinkle with remaining Pecorino, orange zest and parsley. A simple yet luxuriant dish to greet your family with on a Jack Frost nipping night. Try and get hold of the best pork sausages you can – preferably Italian, if not, choose ones with a high meat content. Skin the sausages and place in a bowl. Add the thyme, and a little salt and a good grind of black pepper. 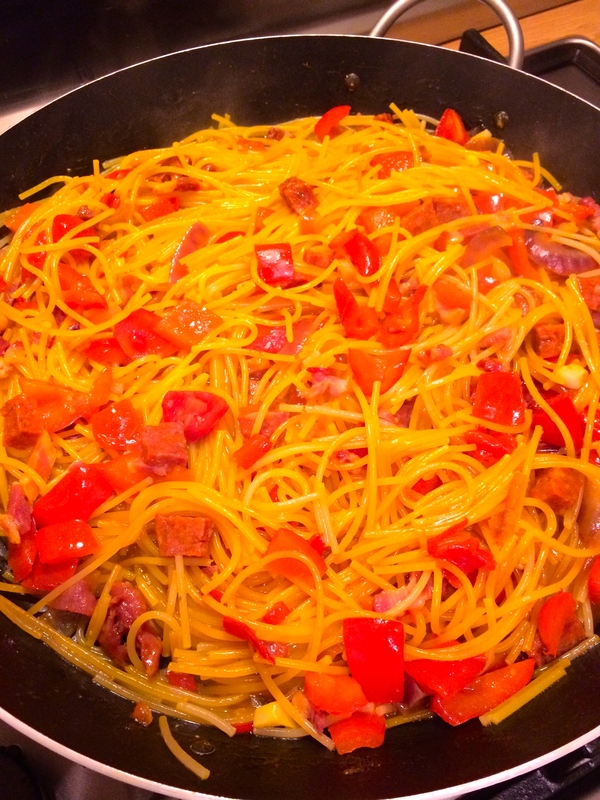 Melt the butter in a large frying pan – I used a sauté pan. 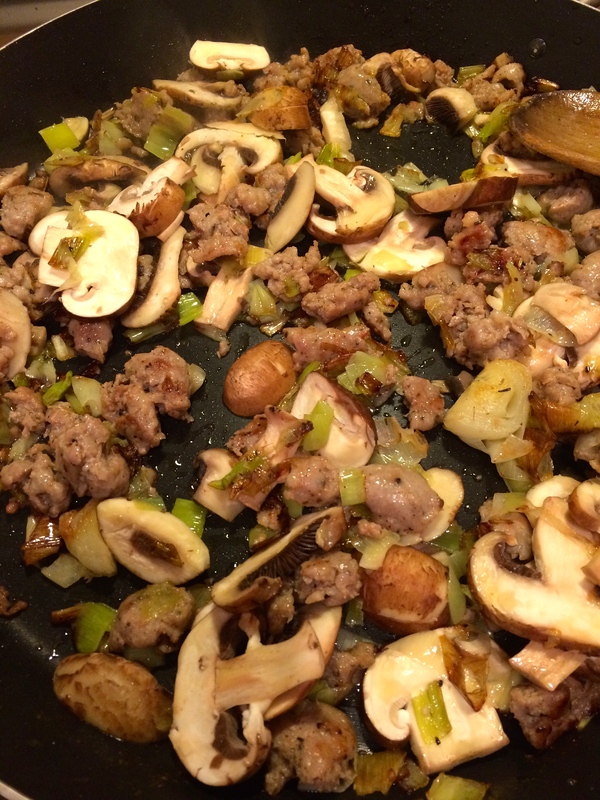 Fry the sausage meat and the leek for 10 minutes on a medium heat, stirring and breaking up the sausage meat. Try to crumble the meat as it cooks and browns. Add the mushrooms and cook for a further 5minutes. Pour in the wine and cook for another minute before pouring in the cream, stirring and cook for 2 minutes on a low heat now. Set to one side away from the heat. Cook your pasta. Drain and tip back into the same pan. 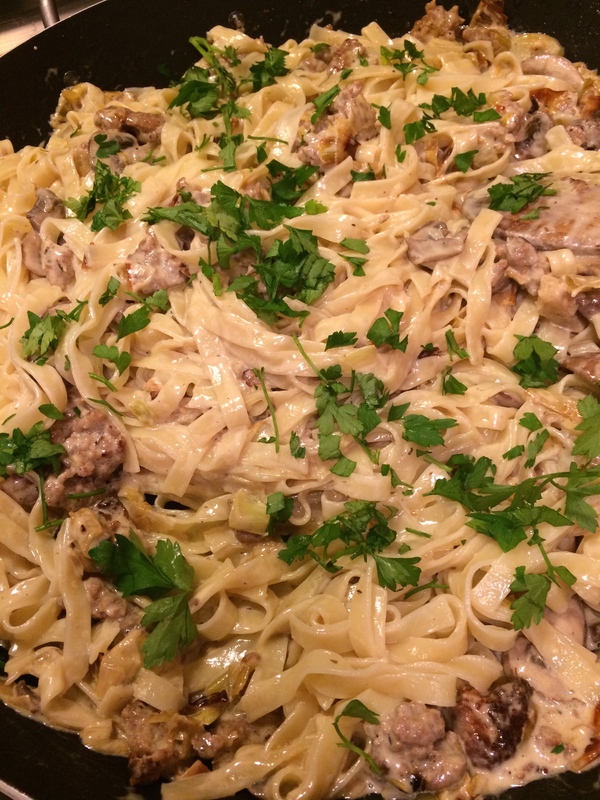 Pour over the creamy sausage meat mixture and the parsley and stir everything together well. I promise you – this is a dish your friends and loved ones will want you to do again and again. 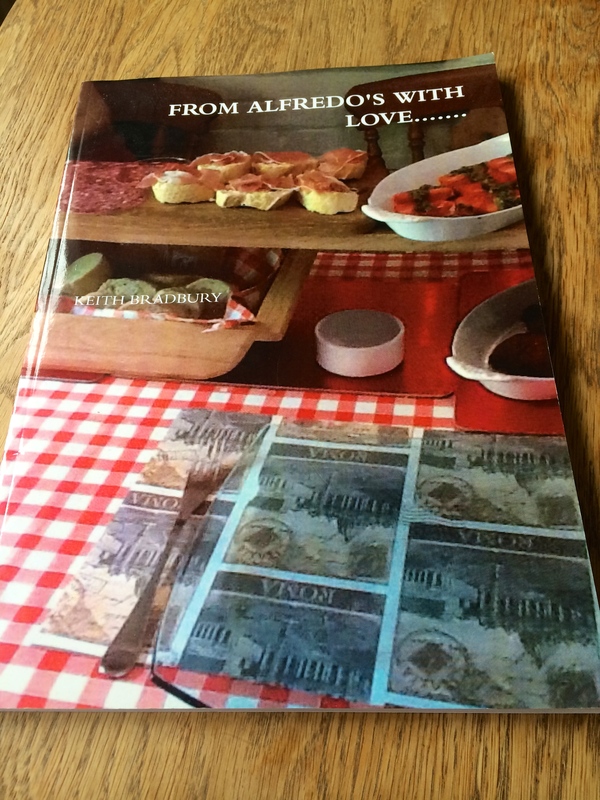 I loved making it – another brilliant recipe from Gino D’Acampo. Grazie! This is the simplest supper supreme – yet it needs care and love and attention. Be patient – use the best ingredients and you cannot…well not really… go wrong…really. Put the water on to boil for the pasta with a little oil and salt in. Pop the pasta in for 10 minutes or until al dente. Pan fry the crushed garlic and the lardons til just crispy then take off the heat. Warm a bowl – I use a stainless steel bowl and I pour in hot water to warm it. Crack into the bowl 3 eggs and then with a fork stir in the parmesan cheese. Add a decent grind or three of black pepper and a tiddly bit of salt. Drain the pasta. 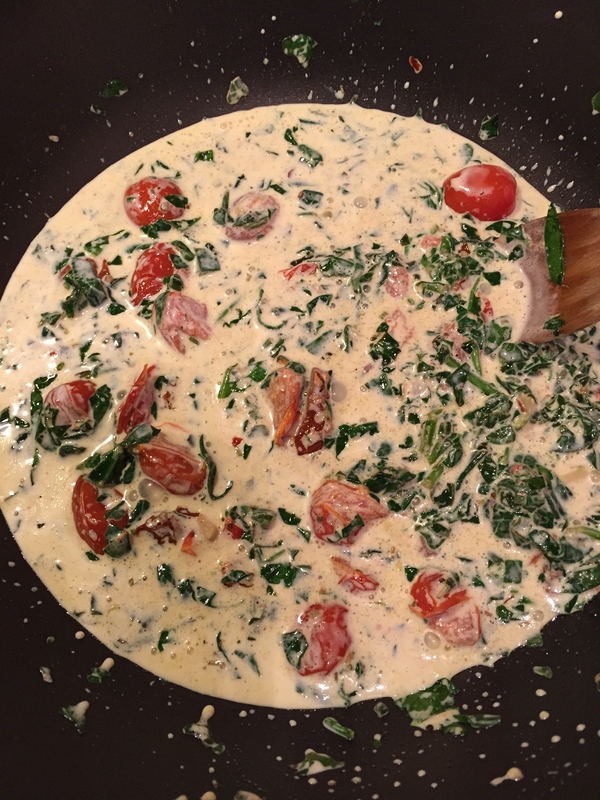 Add the hot pasta to the bowl with the eggs in and if you wish drizzle in a little single cream. Add the lardons and crushed garlic mix with a little of the oil. Stir gently but quickly – around a minute then serve in bowls. Oh this is so tasty and so wonderful and oh so often ruined by many restaurants – either they use far too much cream or over cook it and curdle it to oblivion. With care this is the ultimate simple supper dish. 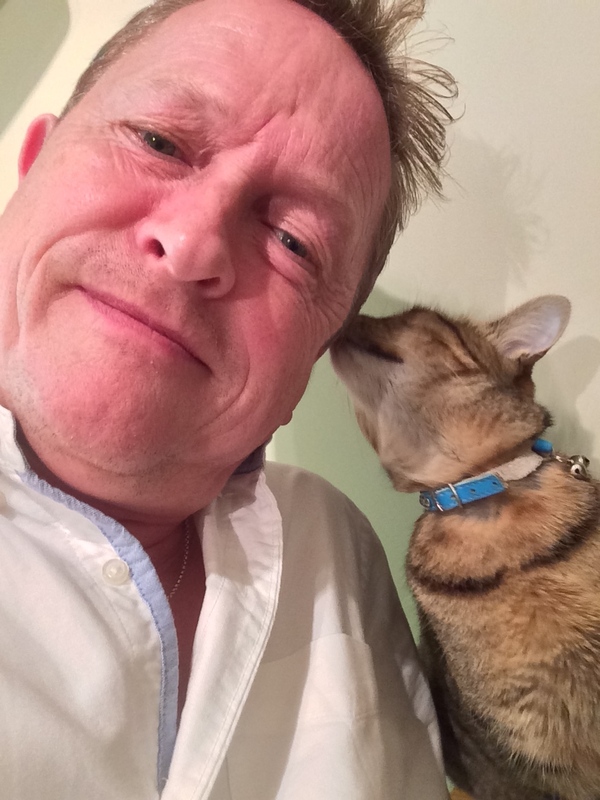 My sous chef, Pip, imparting some last minute tips on the perfect carbonara…. This is a super quick and healthy supper that satisfies the parts you want to reach when you are famished. 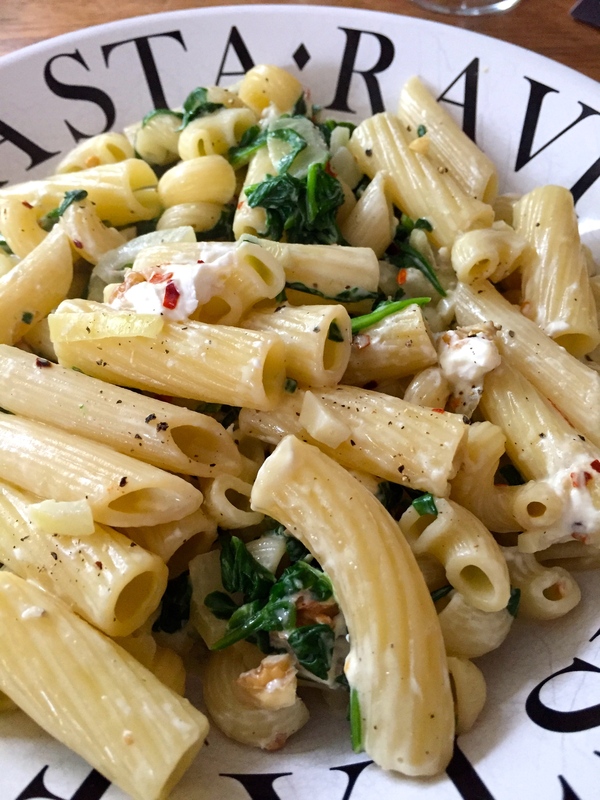 You can use rigatoni or penne or really any shape of pasta you feel passionate about – or have hanging around! In a wok or large frying pan, heat the oil and then gently sizzle the garlic and chilli for about a minute. Do not burn it! Best way is once it is sizzling just remove it from the heat for a minute – works fine. 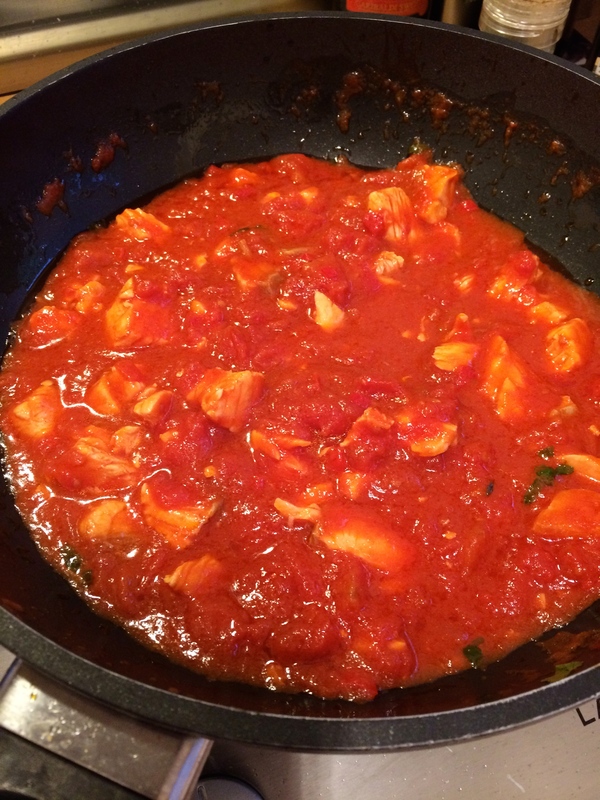 Add the chopped tomatoes and stir and simmer gently for 10 minutes uncovered. Carefully stir in the salmon pieces and season with a pinch of salt. Remove from heat whilst the pasta cooks. 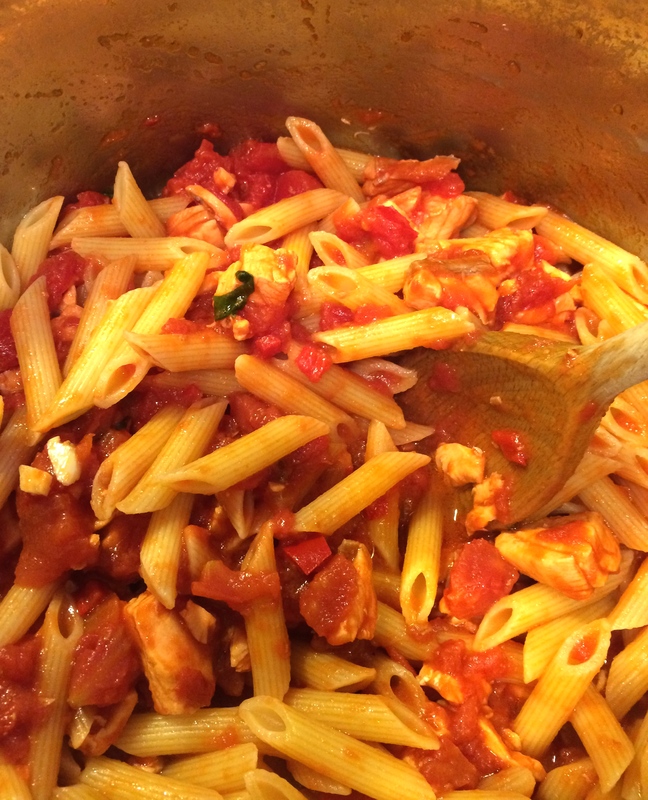 Drain the pasta then and return to the pan, pour in the salmon sauce and stir over a low heat for 30 seconds or so. This is a super summer supper dish or a lazy lunch perfect with a glass of rosé or a crisp white. 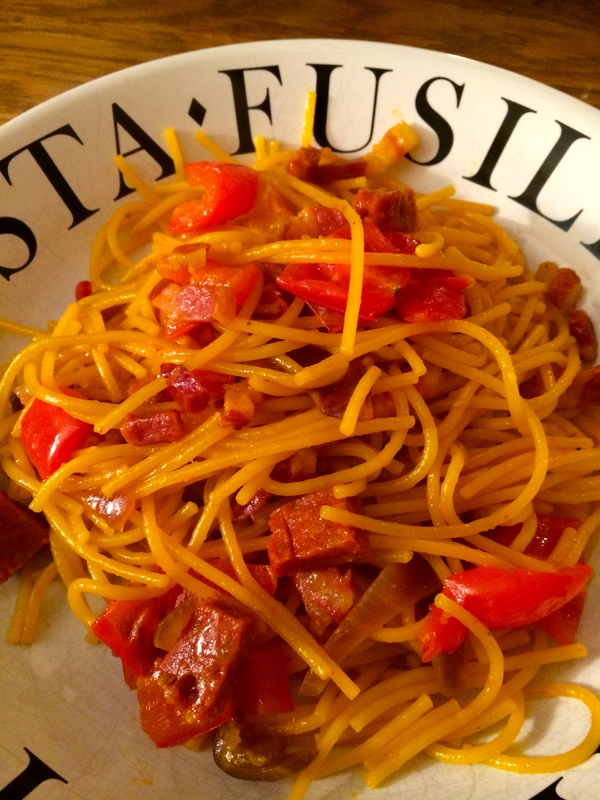 This was a swift store cupboard special supper and one of the tastiest of the last week. 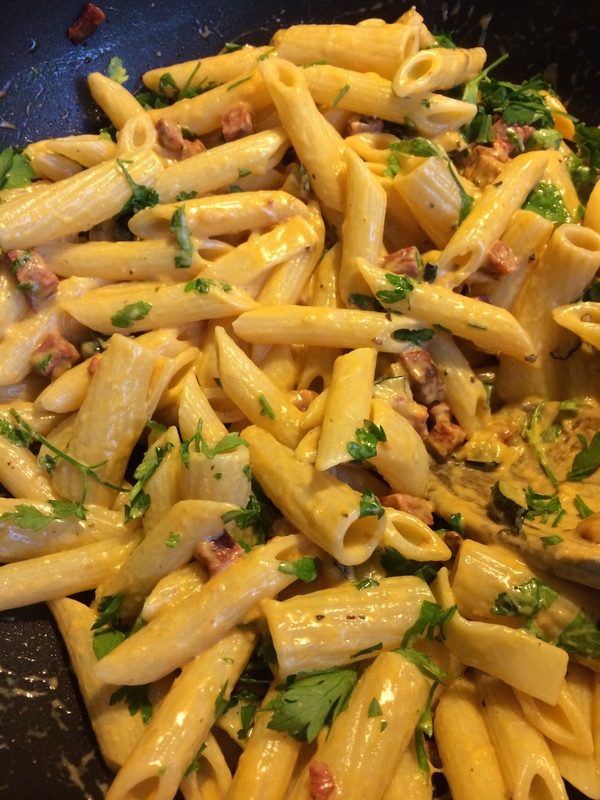 I wanted to adapt my usual lardon and courgette pasta…and the simple answer was replace the lardons with cubed chorizo. The result was a sublime cocktail of flavours that slipped down and satisfied. Do this. It is going to make your week. In a splash of olive oil heated for a minute, add the courgette and pan fry until starting to just brown, then add the chorizo and continue frying gently whilst you cook the pasta. 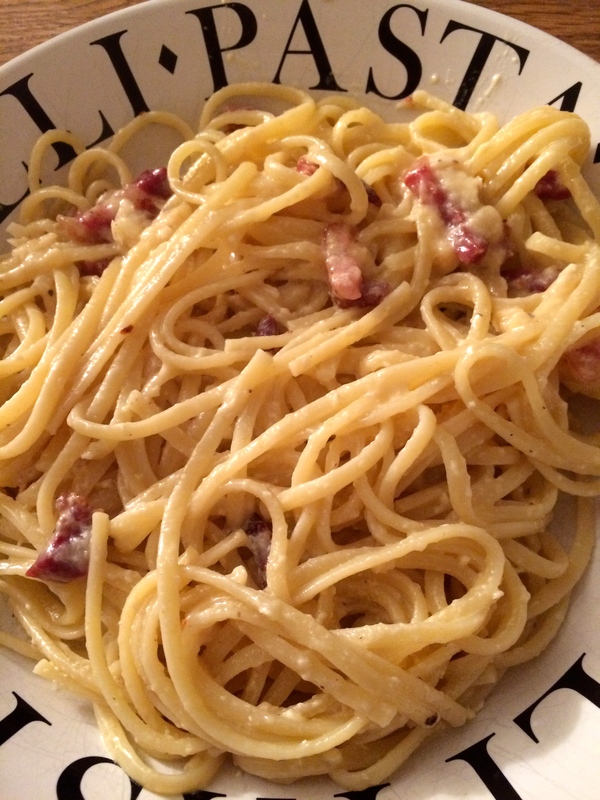 Just before you drain the pasta, add the cream and a grind of sea salt and black pepper. Then add the chopped coriander. Serve on the hot pasta. Quick, sensuous and delectable. It’s what suppers should be.